Here are the nice new Drop Pods from Clear Horizon Miniatures in the US. This is a photo heavy posting detailing a couple of progress shots before I got them on the table. 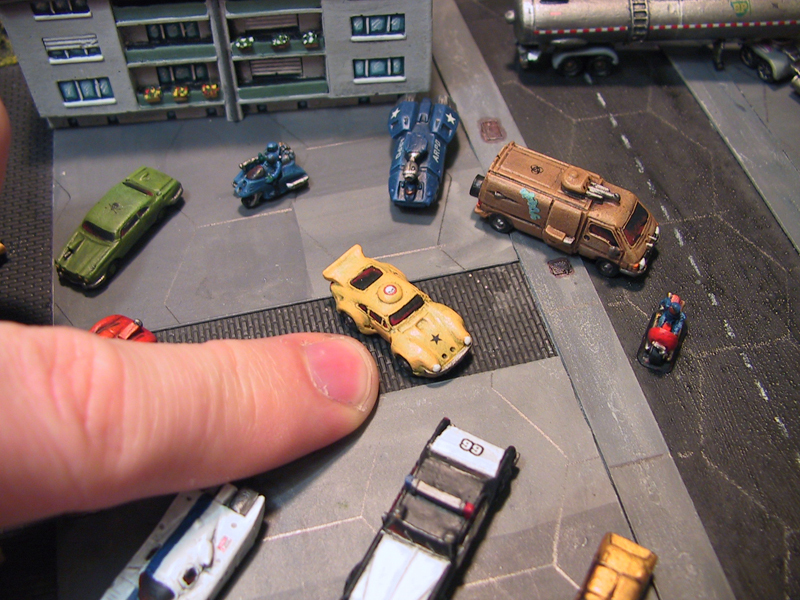 The models are resin and are multipart kits. I had three of them and decided to complete one with the doors closed to show it in the dropping mode. The other two were completed with the doors down, so I needed to add the little hydraulic items which took some time to clean up. Care was needed to put the hydraulic rods in with a small drop of glue in the holes on the drop pod body and the doors. The casting was very crisp with amazing roof top detail and even a small thruster visible on the bottom (which is now hidden on mine). To protect the doors from breaking I mounted them on 60mm diameter steel metal discs. This adds a nice weight to the model and ensures that you don't get any doors knocked off by heavy handed friends placing the pod down. I glued the models together on the steel base with the exception of the three legs that stick out because letting the doors drop to a natural position resting on the metal disc made it much easier to solidly glue everything together. I then added the hydraulic arms after for the doors as the last step. The hardest part was adding the hydraulic struts inside the legs on the side which needed a little sanding and trimming to clip in neatly. They could also be left off if you have trouble with smaller parts because they are not easy to see on the complete model being mostly obscured inside the side leg. I like the detail though, so I was happy to get them properly locked into position inside the leg strut. Straight into the fight with some Garn and a Monpoc big lizard beasty. Khurasan troops deploy from the drop pod. The unopened drop pod has landed badly after a deviation roll. For painting I used a technique where I airbrushed a based colour (Life Color Israeli Sand Grey) followed by an airbrush coat of AK Interactive Heavy Chipping Acrylic fluid. I think I should have used their weathering fluid rather than heavy chipping because it started to flake a lot more than I thought when I applied water to it on a brush. Using this chipping fluid is like the hairspray technique which airbrush modellers use. 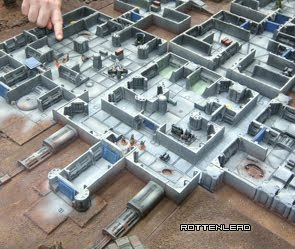 They normally decant the hairspray into their airbrushes before coating a model and AK have spotted a gap in the market by providing something similar to hairspray which can be rubbed off a model with water. I wanted my drop pods to look very weathered and worn out from multiple drops. I also liked the idea of making them white like traditional modern space ships and sci-fi. It was a bit of an experiment with a pale white weathered scheme and heavy chipping. Both the pale white and the chipping were techniques I don't normally use so I was interested in the final result from a learning perspective. In retrospect I think I could have used a darker base colour before applying the chipping fluid. This would have given the weathering a bigger contrast when the top layer of white was rubbed off. To add contrast and colour I instead used the Lifecolor rust box set to apply grades of rusting to the edges and worn areas. There were also several washes applied using GW and Lifecolor Tenscrom inks. This added contrast in the darker recesses. Decals were from my collection of Gundam decals and they went on very smoothly after I applied the Gloss varnish (after the chipping was complete). You have to seal the chipping stage with a solid gloss varnish airbrushed on or you will find the paint continues to flake as you add layers of inks and other paint. The gloss also makes the decals go one very easily, staying flat and washes go very easily into the detail when applied onto gloss. You just have to remember that the model is going to look a little different when the flat dull matt varnish is finally applied. AK Interactive Heavy Chipping fluid for Airbrushing. Apply a primer coat. I used Tamiya fine Grey primer in a can. Apply a based coat. I used Israeli Sand Grey from Lifecolor (You could use a dark brown). 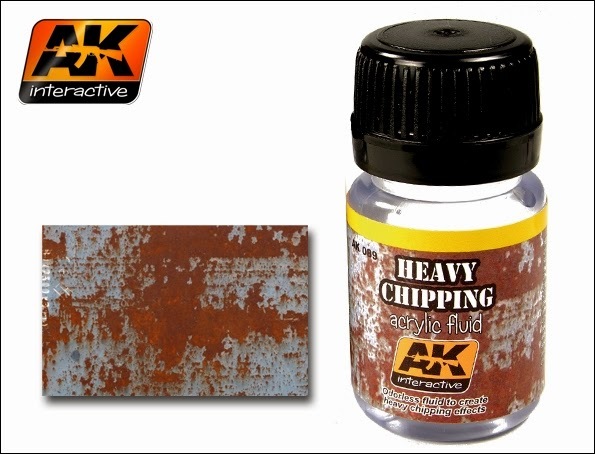 Spray on AK Heavy Chipping fluid. Let the AK fluid dry and then spray on a layer of white. I used a white from Lifecolor Air. Let everything dry for an hour or two. Moisten a brush (I used size 2). Then rub the brush onto areas you want to weather. The result is paint pealing off revealing the base colour below. You MUST then seal the model with a gloss or similar varnish to prevent further loss of paint. Final stages adding silver pencil rubbed onto the rusty edges. 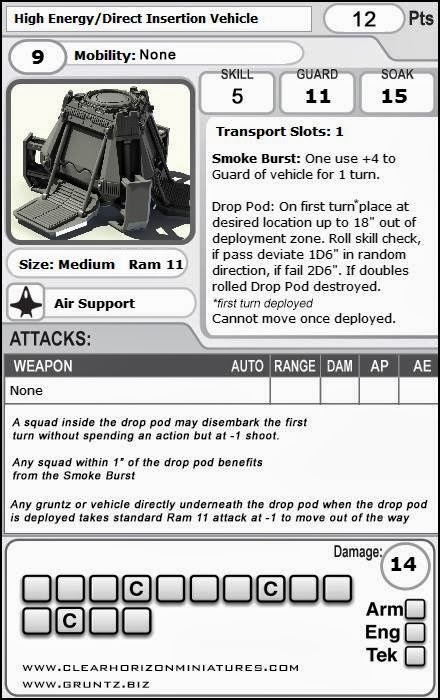 Here is the statistic card and rules for the Drop Pod in the Gruntz game.